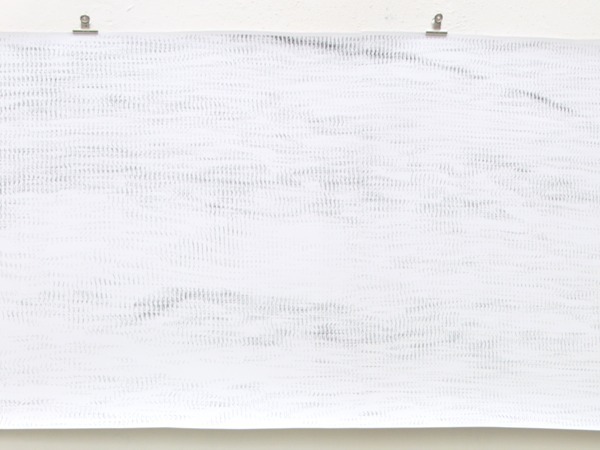 A simulation program for physical processes is used to generate large scaled prints of ‘proto-text’ - the Text Fields. Long lines of permutating letter-like structures resemble a strangely unaligned text that suggests meaning where there is merely the coherent calculation of natural forces affecting thin strokes with a set of physical properties. From left to right the lines, ticks and curves agglomerate to proto signs, exchange strokes with each other and finally disintegrate or merge into other structures or lines. The Text Fields are evolution-charts of meaning. When a proto sign doesn´t make sence it´s slingtly mutated neighbour might.